Our applications period begins January 1 each school year. There is a priority deadline of February 6, but applications will remain open. We will make admission decisions by March 15, and will notify families shortly thereafter. Children entering preschool must be four years of age by August 31. Children entering kindergarten must be five years of age by August 31. 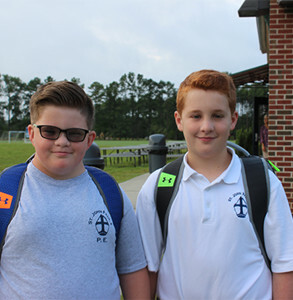 Students applying for admission in 1st through 8th grades must present a copy of the current report card and standardized test results and any IEP or 504 plan applicable for review and determination of whether our program will meet the educational needs of your child. An interview with the student is often part of the admission process. We may require incoming students to participate in testing in some academic areas. St. Anthony of Padua Parish Participation Voucher (please call St. Anthony's Parish) or Sacred Heart Parish Participation Voucher if you indicated Catholic on application. All new students enter a trial period in which to prove themselves both socially and academically. If during this trial period there are any serious concerns regarding a child’s safety, academic fitness, or general impact upon the learning environment, we may ask a student to withdraw his/her attendance at Saint John Paul II School. We will admit non-Catholic students whose parents accept the philosophy of Saint John Paul II Catholic School on a space-available basis. Choose a convenient payment option to suit your needs. Administrative fees are subject to change. We draft payments from FACTS account regardless of payment plan selected. All tuition payments require enrollment in the FACTS program. SJPII uses the parish participation voucher to confirm that you are an active parishioner. If you are moving from outside of the Sandhills area, please have your current parish complete the voucher. We award any discounts based on the discretion of the local parish in which you are now registered. Please download and print the Sacred Heart Parish Participation Voucher, or contact St. Anthony Parish for that voucher at (910) 692.6613. On behalf of the Diocese of Raleigh Office of African Ancestry Ministry & Evangelization (AAMEN) and Native American Catholic Community, we offer an opportunity for African-American and Native American students to apply for the Tuition Assistance Award. The funds for the awards come from the Black & Indian Missions grant awarded to the AAMEN office. Over the years, the office has provided funds to the Catholic Schools of the Diocese. For the past decade, the focus has shifted towards family assistance instead of schools; thus we encourage financially eligible families, regardless of school, to apply. Saint John Paul II School admits students of any religion, race, color, and national or ethnic origin to all the rights, privileges, programs, and activities generally accorded or made available to students of the school. It does not discriminate on the basis of religion, race, color, national or ethnic origin in the administration of its educational policies, admissions policies, or athletic and other school-administered programs. $50 application fee for all new students required at the time of application. $250 registration and technology fee for new students due within 10 days of acceptance to SJPII. Returning students pay a $150 technology fee rolled into monthly payments. Scholarship and financial assistance is available for qualifying families. Please complete the online application and submit supporting documentation directly through the FACTS Grant and Aid Applicant portal by March 23. Award recipients receive notification in May. North Carolina law requires all children in the state to receive certain immunizations by the time they enter kindergarten and the 6th grade.